I want to put something out here that has been on my mind and heart lately. Many of you know that I was a “fat kid”. I wasn’t sweet and cute, I was overweight, had thick glasses, and I was smart. NOT a great combo, ESPECIALLY when the subject is bullying. But even WORSE when the subject is self-respect, self-love, self-image, self-esteem, and self-WORTH! Things as simple as doing my favorite thing in the world, which was going to our town’s public pool with my friends, was actually just another stressful situation in my life. Oh sure, I had some great friends who never cared, and stuck up for me when the bullies would bother me, and I even pretended to laugh a lot of it off. But the scars from that pain just went deeper and deeper. At the age of 9, I even had a nervous breakdown and was put into a hospital where I was supposed to get help. I got something, but it was NOT help! But that is another subject altogether. Point is, I had no idea what “being normal” even meant. I was always the “chubby girl”, “fat friend”, or my personal favorite “big-boned girl”! UGH! But what did I do about it? I turned to MORE food! It was my only solace. Sometimes, my only friend. ESPECIALLY when my friends started dating! At 12, I started sneaking Dexatrim diet pills, and abusing laxatives. I would eat ONLY jarred baby food for days until I would almost pass out from hunger, and then eat everything in sight. In my twenties, the pain was so deep, that I was actually happy that there was a very high chance that I could not have children, because I feared that I would have a girl and she would be just like me! That was the last thing I EVER wanted for a kid. Especially MY kid! Then when we decided to really find out IF children were even a possibility, I decided that if we had one, I would just monitor the food. I would be sure they weren’t a video gamer and got outside to play and get into sports. The same things that I went through would NOT happen to my KID! However, as most of you know, we were never blessed with children. BUT. Now as a fit adult with the understanding of a “less than fit” past, I can relate to many other people’s struggles. Including young girls. This is one reason I enjoy doing Zumba with the Girl Scouts, and why I love that there will be children EVERWHERE at the Relay For Life event I am doing Zumba at on June 13th in Quincy, IL. AND why I ALWAYS encourage people to bring their children along to my classes for FREE!!! But through this blog, through social media, through word of mouth. I have the power to reach a LOT more than I even dreamed possible. But you know what? If I can help even ONE girl feel better about herself. Make her realize that just because she is not the perfect girl that is portrayed in movies, tv shows, music videos, on the internet, and in magazines, does NOT mean that she has no worth! Even if I have to do it by motivating and helping their moms, I MUST try to do whatever is in my power to keep children from feeling like they are less of a person because they are overweight. Helping the kids when I can and helping the Moms AND Dads be better role models to help give them a fighting chance. I didn’t have that, but the kids in my life, whether they are mine or not, will always know that being active and having fun WHILE being fit is an AMAZING way to live your life! Just because I am not a Mom, does NOT mean that I can’t have a positive influence on the children of the world. 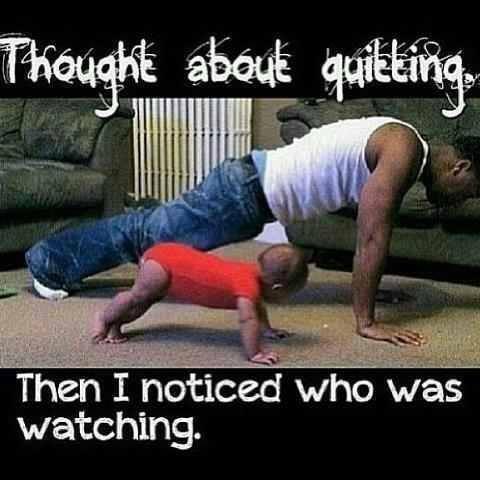 Let me know how I can help you be a good fitness role model for the little ones watching YOU!